One of those long time runners and one of the Scandinavian pioneers in the beginning of the new Scandinavian Free Radio era. The station is hosted by a very odd DJ that probably will go to the history as the sing-along-an-oldie-DJ. Almost every record that was played was to be destroyed by Kim Hawks voice singing over and under the music. This station was first heard the 13th of December 1992 via a relay of Radio Fusion International. By that time, Kim already had his transmitter working but he had no antenna ready. 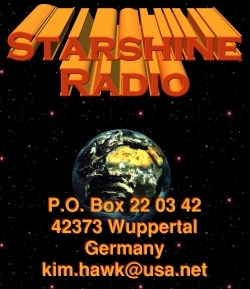 So the first time Starshine was on air via their own outlet was the 16th of January 1993. This station was normally heard on 76 Mb, but was later also heard on 41, 43 and 48 Mb with test-transmissions. During 1994 and 1995, this station was Scandinavia’s most active station. The last transmission was also in relay, via Alfa Lima International, in 2002.